The citizens of Baltimore are finding out the hard way that demonizing cops often comes with hellish consequences. Baltimore Mayor Stephanie Rawlings-Blake gave looters and criminals “space” to destroy private property during the Freddie Gray riots and they returned the favor by shooting a whole slew of people. Another violent weekend caps off what’s been one of the deadliest months in Baltimore history. In just 30 days, there’s been more than 100 shootings across the city. Despite the mayhem, the mayor says the city is improving. Police say a total of four people were shot on Sunday. No arrests have been made. The number of nonfatal shootings is 219 this year — compared to 120 at this time last year. One-hundred shootings in 30 days — an average of a little more than 3 shootings a day. Say you’re a Baltimore police officer. You were told to stand down while a bunch of looters threw concrete blocks at your face during riots. You watched local businesses burn to the ground because criminals needed “space.” You witnessed Marilyn Mosby get on stage during Prince concerts for Freddie Gray, and you sat in stunned disbelief when she said her Twitter account’s favorite anti-cop tweets were chosen by a mysterious hacker. Would you proactively police the city? I think not. “I’m hearing it from guys who were go-getters, who would go out here and get the guns and the bad guys and drugs. They’re hands-off now,” Butler said. “I’ve never seen so many dejected faces. The vast majority of cops are good people. They risk their lives working long hours on a thankless job. When they screw up, they’re called “racists,” “pigs,” and a wide assortment of other derogatory names. When they’re proactive, they’re tyrannical monsters, but when they pull back in the face of criticism they’re accused of letting crime run rampant. It’s a Catch 22. Why on earth would anyone want to do police work in Baltimore when the guy burning down a CVS Pharmacy gets more sympathy than the guy who has to wear a bulletproof vest to work each morning? It makes no sense, which is why Baltimore’s crime rate is currently out of control. If Marilyn Mosby is smart, then she will meet privately with law enforcement personnel for a much-needed mea culpa. If she is dumb, then she will continue to say and do weird things that exacerbate the city’s underlying problems. Sadly, it is Baltimore’s poorest and most vulnerable population that will pay the price for woeful leadership. Worked the closing shift at many stores in many rough neighborhoods in my day….I’ll always have an appreciation for the police. I was reading about west Germany in the immediate aftermath of ww2, one of the first things the Americans established was a police force of Germans trained by MPs as some semblance of order was needed to rebuild the country. Baltimore will never be able to right itself if it’s lawless; the mayor at some point has to say enough is enough and let the police do their jobs. Black (and all) lives do matter, and the death toll is rising now. I’ve had to deal with jerk cops and I’ve dealt with cops that were just super cool guys. Whether they have good attitudes or not, they’re still doing an incredibly difficult job. I remember when I was attacked by a homeless guy in Los Angeles who was screaming “You let the f**king Puerto Ricans escape!”… I was glad a.) that I somehow managed not to get knocked into oncoming traffic when the guy barreled into me from behind, and b.) that a cop was right there when it happened. I can’t imagine what some cities would look like if all the cops just took the week off and sat on their butts. You wouldn’t need to see Mad Max in the movie theaters — you could just look outside your window. Unfortunately, the smartest thing cops (especially white cops) can do now is to sit on their butts and take an eight-hour coffee break every day. My advice to cops in major cities would be to quit their jobs and go into some other line of work. (In some cases, they might be able to get jobs as firefighters or EMT’s in the same city or county, and maybe their time served as cops will count for seniority and retirement.) If that is not feasible, they should request transfers to desk jobs. If neither of those is possible, maybe they could get jobs with small-town police departments or county sheriff’s departments in rural (and overwhelmingly white) areas, to reduce the risk of getting into a cross-racial confrontation. If that is not an option (maybe a cop has been with the LAPD or NYPD for nineteen years and eleven months, and is too close to retirement to quit), then they should avoid cross-racial situations at all costs. When responding to a call about a mugging or carjacking, drive within the speed limit, and stop at all red lights and stop signs. Be sure to allow the suspects plenty of time to get away before you arrive. There are enough white criminals for you make at least one felony arrest a month, and enough white reckless drivers for you to write three tickets a day. You essentially capture the sentiment of Lt. Victor Gearhart’s “God help them” comment from the Baltimore Sun piece. These communities that are crying foul over the cops are going to get the policing they demand. If the vast majority of cops really were unfairly targeting individuals, then you would not see a spike in violence when they took their foot off the gas pedal. 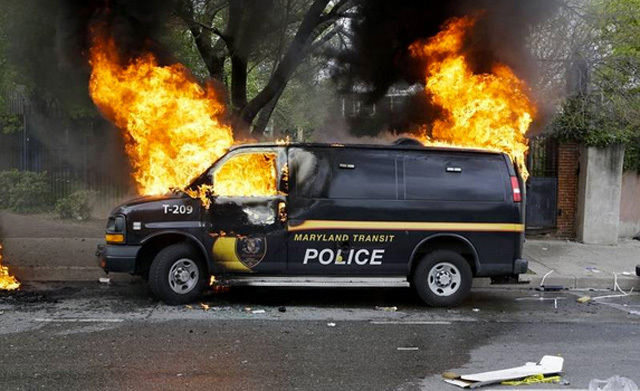 The cops ease off in Baltimore, and crime goes through the roof. Telling.